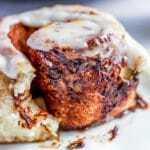 This recipe for the best homemade cinnamon rolls is delicious and simple! The filling is nice and flavorful without being too gooey, they are the perfect balance of roll and filling! Mix 3 cups of the flour with the rest of the dry ingredients together in large bowl and create a well in the center. Add the egg, butter, milk, and water to the dry ingredients. Mix until combined. Add the remaining cup of flour and mix until combined. On a floured surface, turn out the dough and knead until it comes together and is smooth, about 6-8 minutes by hand or 4 minutes in a stand mixer. Combine the brown sugar, cinnamon, and salt. Roll out dough into a rectangle, about 1/4 inch thick. Spread softened butter evenly over the top of the dough. Sprinkle the cinnamon sugar mixture over the top of the dough and spread it out evenly. Press lightly to adhere the cinnamon sugar mixture to the butter. Roll the rectangle up tightly (you will be rolling the long side) so that you have a long rolled log. Cut the log into 12-15 even rolls. This is most easily done by dividing the dough into 4 pieces and then each of the 4 pieces into three pieces (for 12 cinnamon rolls) or dividing the dough into 3 pieces and then each of the 3 pieces into 5 pieces (for 15 cinnamon rolls). For rolls with soft sides, place them 1/2 inch apart on a sheet tray, in a pie plate, or in a cast iron skillet. For rolls that do not touch, place 1 1/2 inches apart. Be sure to grease whatever you use to bake them in. Cover rolls and let rest for 15 minutes. Uncover and bake at 350 degrees F for about 20 minutes, the tops will just barely start to turn golden and the center cinnamon roll will be cooked through. Add in half of the powdered sugar and the milk, mix until smooth. Add in the rest of the powdered sugar until your desired consistency is reached, I like the icing to be thick but pourable. Pour icing over rolls as soon as they are removed from the oven.